During World War II, Ocracoke was also used by the U.S. Navy Beach Jumpers, the forerunners to the Navy Seals, specializing in psychological warfare and deception. These units were organized by Admiral H. Kent Hewitt, but the concept was that of Lieutenant Douglas Fairbanks, Jr., who, during raids with the British Commando, developed an appreciation for deception as a military tactic and wanted to explore it further. At the start, 180 officers and 300 enlisted men were needed to start the program, and Admiral Hewitt was put in charge. There were four requirements men had to fill if they wanted to become a Beach Jumper volunteer: basic knowledge of navigation using the stars, experience with handling small boats, no propensity for seasickness, and basic electrical knowledge. Ocracoke was chosen for a Beach Jumpers’ base because of the island’s remote location. During and immediately after the war, Ocracoke was only accessible by private boat, mailboat, or plane. The Beach Jumpers trained on the island from December 1943 through January 1946. This was a top secret organization, meaning islanders knew nothing about the operations of the Beach Jumpers, and during this time, the base and the beaches were off-limits to locals. On Ocracoke, the Beach Jumpers trained by organizing simulated invasions and battle scenes by setting off smoke pots and exploding firecrackers. They also experimented with tin foil-covered balloons in order to obstruct communications. 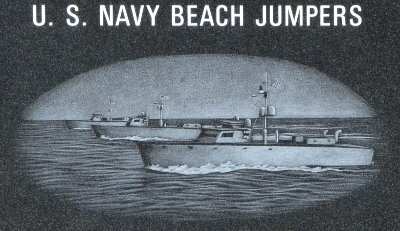 Although the memorial to the U.S. Navy Beach Jumpers is near Loop Shack Hill (another Navy installation) along Highway 12, the Beach Jumpers were not using Loop Shack Hill for it’s original purpose, which was protection against U-boats.